When I ask my friends what they’ve been grilling lately the answer is usually a meat or a vegetable. This is the norm but what if I told you that grilling fruit is to die for? If you think I’m off my rocker, you’re not alone. When I first offered my very British Father some grilled fruit he kindly took the time to tell me exactly why he thinks I’m mad. He still refuses to try any samples but hey his stubbornness is my reward…means more grilled fruit for me! Grilled fruit is a favourite around here and today I’m happy to share my Grilled Peaches Recipe with you all. It takes just a few minutes and is oh-so good! This is such a simple dish, the most difficult part (which isn’t difficult at all) is halving the peaches. 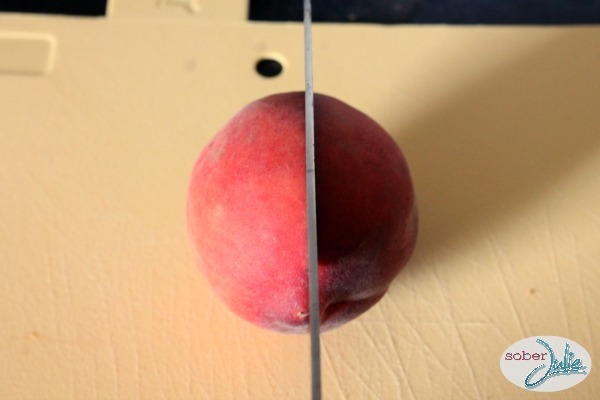 On a cutting board, cut into a peach until it hits the pit in the centre. 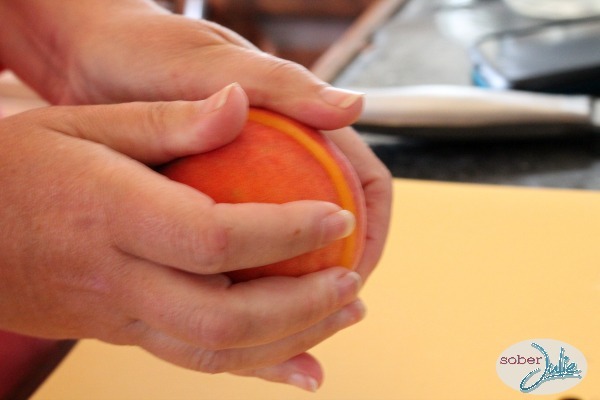 Now turn the peach and continue cutting around the whole peach. 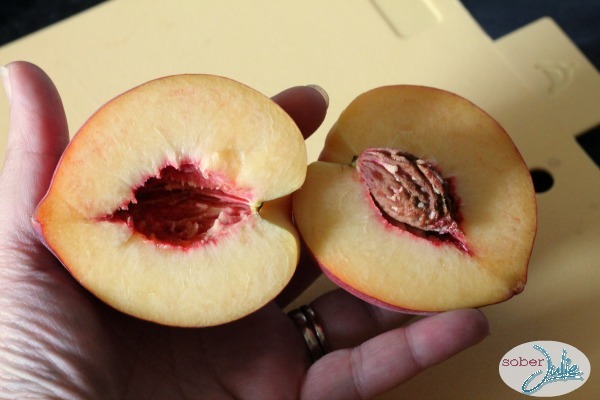 Once it’s opened you may have to cut around the pit to get it out, if your peach is more ripe it will be easier. Now just brush the maple syrup onto both sides of your peaches and place onto a grill which has been pre-heated to medium (approx 350 degrees). Grill the peaches approximately 4 minutes a side with the lid closed. Now transfer to a plate and top with sliced strawberries, blueberries and whipped Cream. I think you’ll agree this is a simple recipe which everyone will enjoy! The only fruit I’ve grilled previously has been pineapple. Those peaches look pretty good though so I am going to have to give them a try. some grilled corn on the cob, and the peaches like you did! I’ve done bananas/pineapples before,and peaches really sound delicious :)I think this may be my next favourite. Hi Julie, it says “You can enter the 2 giveaways using the Rafflecopter forms below.” but I only see one. Am I losing my mind? haha. Burgers, ribs, steak, hot dogs, corn, veggies, potatoes just the usual things, we grill every day! grilled plantains and bacon wrapped apples and iced tea! I’d love to try the grilled peaches recipe! I never would’ve thought to grill peaches, they do look soo good too, thank you for sharing! I am a pretty standard bbq’er. But now peaches what a great idea, never crossed my mind. Thanks. Grilled peaches?!? I will have to give that a try. We love grilling pineapples on our BBQ! I don’t have a bbq cause I’m in a condo, so anything I grill will be on my George Foreman grill, but I’d love to try your grilled peaches. I tried the grilled peaches last night and they were delicious! The whipped cream topped them off just perfectly. We will definitely be grilling these throughout the summer. Such a tasty, simple and satisfying dessert. Yum yum! 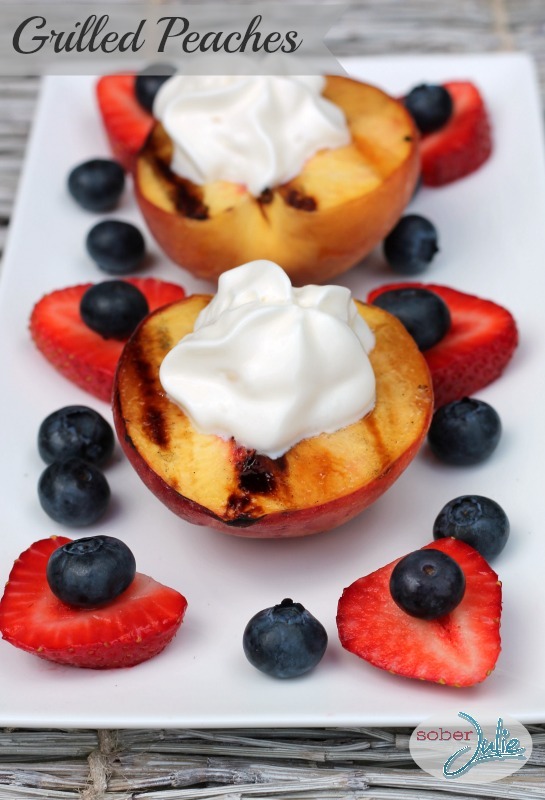 those peaches look great – must try grilling them – love fresh Ontario peaches!! I have never grilled peaches, but have done pineapple before so I am sure we would like peaches, too. I love grilled fruit, but have totally forgotten about doing it – this post inspired me and I bought some peaches at the store today. We are ready for dessert! I will be grilling pineapple with Caribbean Jamaican jerk seasoning! I like grilling hamburgers and chicken. We will be grilling up chicken, ribs, hamburgers, hot dogs, and peaches (gotta try ’em!) this summer. We love BBQ season!! The only grilled fruit I have ever had was bananas. I am now inspired to try peaches and pineapples. Cooking up lots of meats likes sausages, steaks, chicken breast. I also love to grill up some pizza on the BBQ. Yum! I hope to try a lot of new burgers on the bbq…all different kinds. Love fruit grilled on the bbq pairs great with the meat. i’ve never tried grilling a peach before – looks tasty! 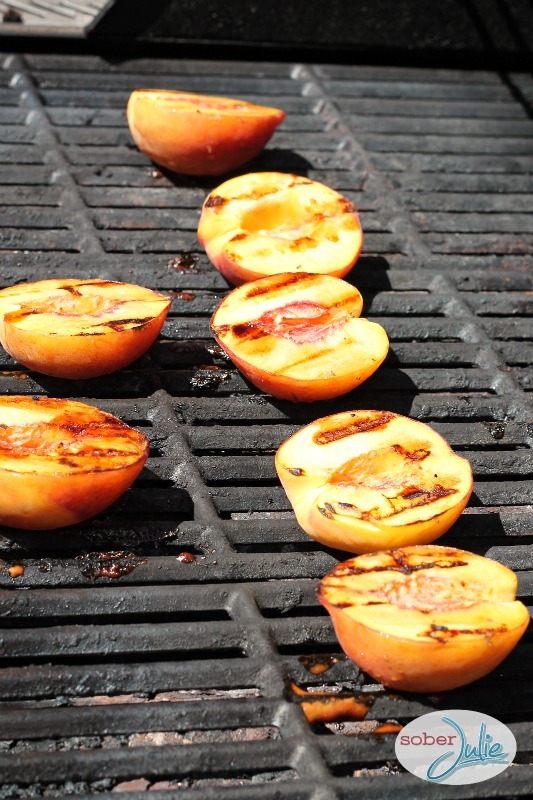 Grilled peaches are amazing, so I can’t wait for the chance to try this recipe. We are cooking up steak, chicken, steak and veggies on the BBQ. I will definitely also adding the grilled peaches to the menu. I love how grilling fruit makes it look so elegant with the grill lines. An impressive dessert that is rather easy to make. And tasty too. We will be cooking lots of homemade hamburgers and roasted veggies. Love grilled peaches! I run to my bbq alot in the summer to keep the heat out and give the ac a break! We will definitely try the grilled peaches and we love using our bbq to grill corn on the cob all summer long! Thanks! We will be grilling up lots of burgers, steak, veggies from our garden and trying grilled peaches! You make all your recipes look so good, I’m not a big peach eater but these look really yummy!! Barbecued chicken, ribs and burgers! I will be grilling up lots of zucchini and steak! I love to grill shrimp and corn on the cob. I have never tried grilled fruit of any kind. This does look easy and delicious, so we will try them this year. 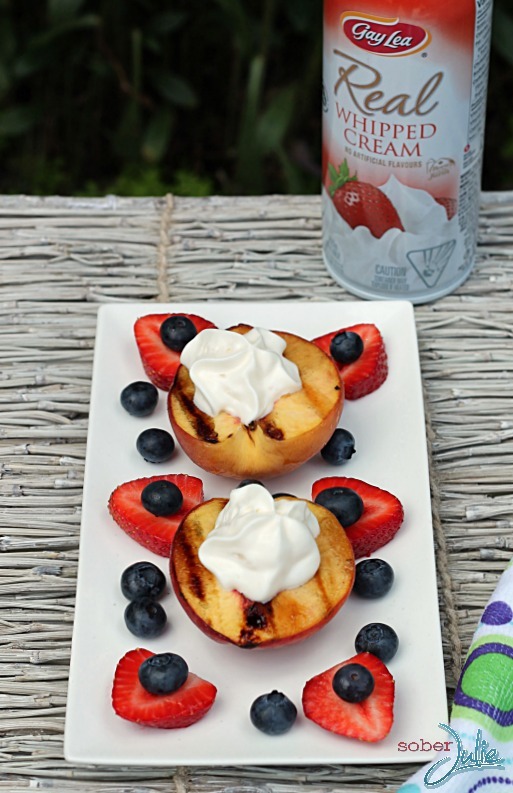 Another great reminder to get the peaches on the grill this summer!